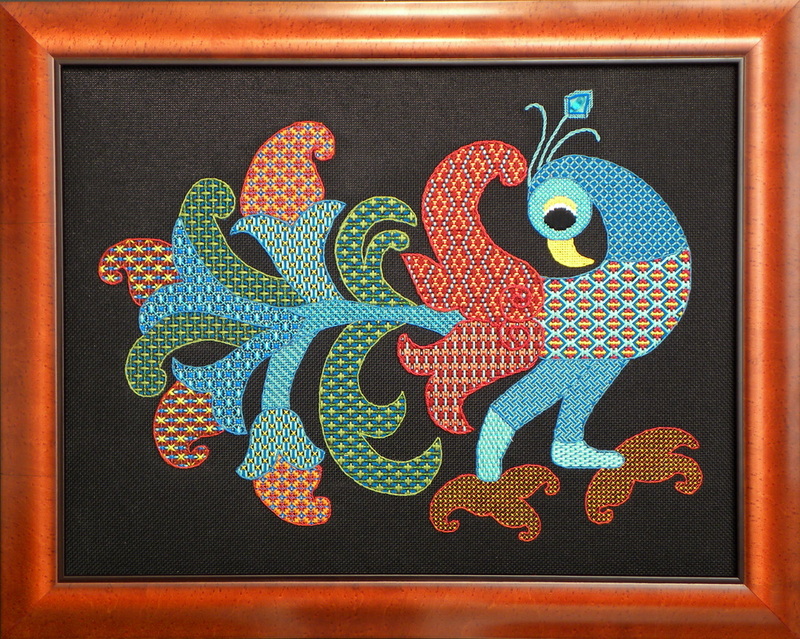 This unusual interpretation of a peacock is adapted from a Sri Lankan batik that I saw in the home of one of my son’s friends in Alexandria. This commercial artwork was purchased in Sheran’s native country and he was delighted with my interest in adapting it to needlepoint and using it as a teaching piece. The original design source was altered somewhat to make it easier to interpret on 18-count canvas. I enlarged many of the individual “feathers” and widened the legs to create larger pattern areas, and I eliminated one of the tulip shapes along the lower side to make the design less crowded. Instead of adding all of the paisley details in the batik, I used busy patterns to achieve a similar effect. The peacock’s head is charted to keep the elements symmetrical and uniform but all of the other elements are freely drawn. Most of the composite patterns are solid treatments but some are slightly open. Many of these are couching patterns and two of them are also beaded. The combinations of stitches used were carefully chosen so that any awkward compensation could be avoided along the curves. Some of the patterns are variations of traditional ones like Parisian and Alicia Lace but most of the fillings are original arrangements. All of the areas will be outlined in back stitches to assure that the curves will be smooth. These outlines will be whipped after the fillings are added to eliminate the dimples of the sinking holes. The final appearance will be more like Stem Outline. THREADS. A variety of threads are used in this design. The basic staples are #5 and #8 pearl cotton, but additional novelty threads include silk and cotton floss, Petite Very Velvet, Petite Sparkle Rays, Burmilana, Neon Rays and three different Kreinik metallic braids. COLOR CHOICES. No color choices will be offered for the threads in this design but students who prefer a light ground may choose between eggshell or butter cream. TEACHER PROVIDES: All materials needed to complete the design plus a detailed instruction booklet with a color copy of the finished model on the cover and several detail views. MATERIALS PROVIDED BY STUDENTS: 16" X 18" stretcher bars, embroidery scissors, laying tool, 2 HiLiter pens for marking charts, a clamp or frame weight to secure the stretcher frame to the working table, plus any other normal accessories needed to work on 18-count canvas (light, magnifier, etc.). TEACHER’S CLASSROOM NEEDS: Marker board with accessories or any acceptable alternative. U-shape arrangement for student tables preferred. Need large display table somewhere for exhibit of visual aids. Small table needed in front near board for teacher's notebook and stitched model. 1. To share the ways that I adapted from a non-embroidered source by discussing the changes needed to create a better canvas interpretation. To show other examples of such adaptations from non-copyrighted sources as well as copyrighted artwork where I was given written permission by the artist to use them as teaching pieces. A brief discussion of the legal and self-imposed boundaries is always helpful. 2. To share some of my ways to develop original composite patterns with special emphasis on fitting exact shapes comfortably, concealing traveling threads in open arrangements, minimizing the number of thread tails with the use of a shoelace technique and spreading out the secured thread tails adequately to avoid overloaded backings. Many patterns are solid but others are slightly open, enabling the black canvas to provide dramatic contrasts. 3. To demonstrate how simple blackwork accents can add depth as well as contrast to composite patterns. At least one of the feather patterns will incorporate these accents. 4. To show how effective it is to combine some allover patterns (diapers) with softer groundings in a design and to identify the differences between these different types of pattern. We will also discuss how the use of multiple styles, scales, textures, values and colors will add interest and diversity to a design. Paisley patterns are always very busy anyway so such diversity is appropriate. Ways to control color interaction in multicolor patterns will also be discussed. 5. Some unique concepts for charting stitch sequences will also be shared to guarantee a consistent appearance to each step. Strategies to pivot correctly when traveling between rows will be stressed to maintain a proper tension on both ends of every stitch.